A-Tisket, A-Tasket…. While neither yellow, nor green, this year saw to the task of getting the right baskets. As with many tasks and utilities, I am picky, very picky. I fussed and searched and fussed some more for just the right baskets. I had a list of what each basket’s duty would be: to house and carry wool, to carry and hold straw for demos, to carry the day’s or weekend’s food stuffs. Each also had to be well made, sound, accurate and pleasing to the eye. In the end, baskets have been matched with their tasks and I am shy only one: a large, round basket I eyed at the flea market but failed to go back for… the basket I see holding straw in progress and bonnets at museum demos. The baskets at their tasks…. My largest basket is a rectangular one that serves nicely to carry small containers and stands into the millinery for set up. 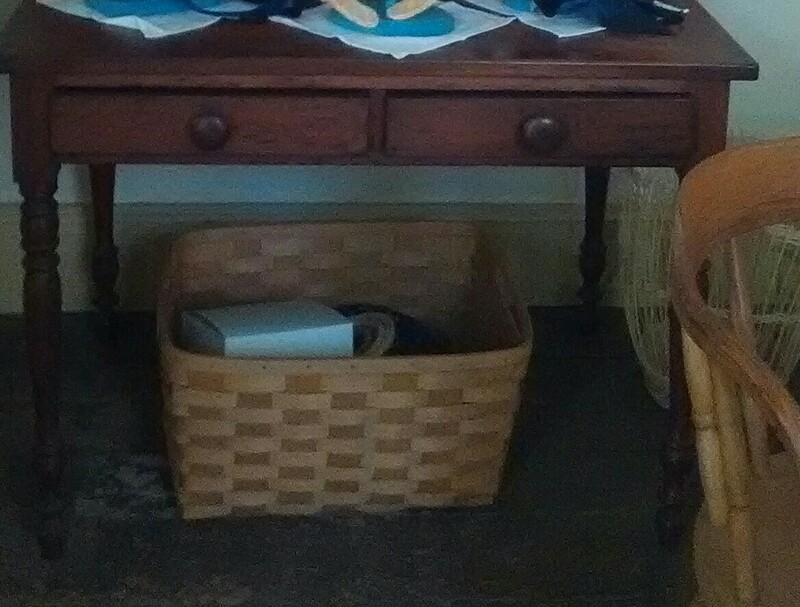 Here it is this past July under the desk in the Millinery Shop. It is in need of some tlc repairs due to cracked and broken areas from when I bought it. This large carrying basket is much like those we used in the 90s and 00s for carrying program materials about. Here is a similar basket at HSV. These next two baskets are “all purpose” baskets. The larger, top is one that was Dad’s it was loose on the top. I am sure basket makers are cringing at my millinery repair using the straw plait. The bottom one is by the GCV’s basket maker. They are nice for carrying. As you can see, each nicely holds a project at home. They can also carry a day’s or weekend’s food into the village. As crocks, especially full crocks, and water can get heavy, neither are overly large. Here is an oval example at HSV, and a rectangular, non-Shaker example at the same. I have named this basket my wool basket as that is its task. When I am making hoods, I need a stash of wool easily at hand in an eye pleasing container. This moderatly sized basket fit that need nicely. Until I find the right straw holding basket, this may do double duty. The shape, with the squared bottom, and round, belly bulging sides, seems to be a common shape. I do still need to look into the decorative shaping in the reed. Here are two examples from HSV showing handles that fold down like this: first one with a loop construction, second with a pivot construction. The newest edition joined us this weekend. I saw this basket a few weeks ago at my favorite bakery while I was picking up treats for work. We chatted about how nice it would look filled with seasonal greens for a table center piece. Well, the basket took root and I just kept thinking about it. This basket is just over a foot tall, perfect for its task as table decor. After the holidays, I think it will continue to serve a decor or have a light task because I suspect it is a bit old. This basket is quite like this example from HSV. While Clara is not a box loving cat, she is a basket loving cat. This basket was part of a gift basket we won. While it isn’t strong enough to carry anything heavy, Clara declared it perfect for her. While looking back through my posts for a previous article on baskets, I came across this photo. I forgot I had this basket. This was taken in my old apartment. I wonder if I have this in storage still. It would be nice. *There are a few, okay several, other baskets at use around the house. But, given their more modern aspects, I’ve not included those.